My FIFA 19 won't launch anymore ?? Someone knows what to do?? Is your anti-virus blocking it? hmm, tried a reboot? Can you verify files on origin like you can steam? ... serious.. i can even launch it on my work laptop that only has a integrated intel gpu! 2 - After that Open the game on the Launcher and right after open it using the desktop shortcut. Tell me gow it goes. Origin running as admin ? I went further and opened a case on EA, and started a live chat with their support... 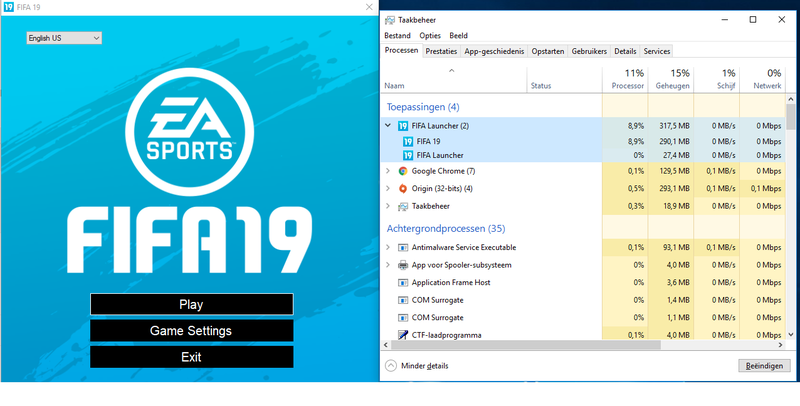 I've done so many things... Cleared cache of origin, internet browser, clear DNS, clean boot, opened origin and the game as admin, repair the game via origin, updated the graphics drivers, check the game for an update..
Have you checked the windows event log to see if there are any errors in there? Always the same **** ..
And the 5th guy now says i have to wait 24 hours before i can test any further.. They have our money allready.. so they don't care about us. Does reinstalling windows makes it work? Anyone have a solution to this that doesn't involve a windows reinstallation?? So a full windows install later and no better - tried on two separate HDD with two different windows versions (Win 7 & 10). No better. Not even an attempt to launch. Anyone? Got the same problem after updated today... tried everything for hours... even reinstalled windows... i press play and nothing happens except a short appearance in the task manager. I'm pissed. Same issue here - been playing with no issue for the past few months and now today - just closes it self after a few seconds. First of all windows is never part of a problem if game worked before on same win. So reinstalling is last, last option. First you should look is GPU drivers. Did you install new version in some recent time or somthing? EA have lot of problems and driver compatibility is on of them. Is there anything in the Event Log to help point to what is causing the problem? I have the same problem. Some fix ?